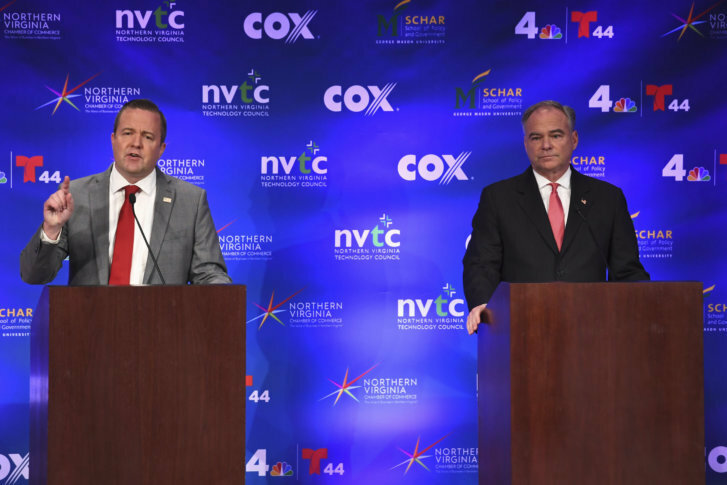 WASHINGTON — Northern Virginia traffic, with its lengthy commutes and slow-moving roadways, got plenty of attention Wednesday night when Democratic U.S. Sen. Tim Kaine and his Republican challenger, Prince William County Board Supervisor Corey Stewart, faced off in their second of three debates. Stewart accused Kaine of having a failing record when it came to commuters. “Not a single nickel for transportation, road construction or anything else got done in Virginia when he was governor,” Stewart said. But, Kaine rebutted Stewart’s criticism. “If you walk out of this building, there’s something called the Silver Line that you will see right when you walk out,” Kaine said to chuckles from the audience. Stewart charged that when Kaine was governor, his administration “sat on” $1 billion of funding for road improvements. “He wouldn’t spend it on road construction. He kept it hidden,” Stewart said. Kaine said he’s fought for federal money to extend the Silver Line to Dulles and beyond, and he said his work also contributed to Express Lanes projects in Northern Virginia. The debate was hosted and moderated by NBC Washington, WTOP’s television news partner. The candidates also tangled over the controversy that has riveted Washington for days — the sexual misconduct charges against Supreme Court nominee Brett Kavanaugh. “It’s a circus up there. This is beneath the dignity of the United States Senate,” Stewart said about the Senate Judiciary Committee hearing into allegations against Kavanaugh from when he was in high school and college. Stewart pointed to the decades that have passed before the claims surfaced. Kaine rejected Stewart’s criticism and defended the hearings to further explore the suitability of President Donald Trump’s pick to fill a seat on the Supreme Court. “You are going after the accusers, as you always do, trying to demean them,” Kaine said. During the hourlong debate, Stewart continually hammered on allegations of sexual harassment made against members of Congress. Following the debate, Stewart told reporters he had no specific allegations against Kaine, but he demanded that Congress reveal all the names of lawmakers accused of sexual harassment. Kaine countered that he’s in favor of disclosing all available facts about sexual harassment cases in Congress. “It should all be disclosed, ” Kaine said, and added that he applied pressure to the Senate Ethics Committee to release the information that it has so far. The candidates also clashed on immigration, race, health care and taxes. The candidates will meet in their third and final debate Tuesday, Oct. 2 in Richmond, Virginia. Watch clips from the debate, provided by NBC Washington, below.